YWT 666 G certainly has some racing pedigree that beats both the works GTS cars combined. With a stunning 49 wins from 100 races this C, in the hands of privateer Malcolm Hewitt, has a development history like no other C.
Registered in March 69 and competing in its first event in April 69 the car had some success but was soon sent to Downton Engineering for full engine lighten, balance and head flowed, 649 cam, triple 45 DCOE Weber carbs, close ratio gears, competition overdrive and 4.55/1 ZF limited slip diff. More modifications happened naturally over the next few years and with wider arches and wider wheels that allowed slicks the car had 36 wins from 57 races between 73 and 78. In 89 the car was awoken from an 11 year retirement and sold on but its racing career was not over. The car was turned into a FIA historic rally car to compete the 89 Pirelli Classic Marathon. After the event the car was again placed into retirement but only a short lived one as the car was sold on again with 25,965 miles on the clock. More work was carried out on the car in preparation for Le Jog 97 and the London to Cape Town Marathon in 98 and then a rather more expansive rebuild prior to the Inca Trail in 2001. 15,000 miles in 55 days right around South America and the car took all in its stride and owners Mike Knox and Rita Shelley even found the energy to get married at the end of the event. The car had more work on its return from the Inca and was stored for some while but again was sold on and in 2007 the new owner carried out even more work on the car including full maniflow exhausts, suspension rebuilds inc polybushes and some overdrive and gearbox work. This owner took the car down to live in France and in 2009 competed in the Rallye International de Charente and was brought back to the UK in 2016 where a new gearbox and overdrive was fitted and some other small works completed. I have become its 7th owner. I have given the car a full service, fitted new tyres, made and fitted a sump guard and given it a few shake down runs to make sure all is at it should be. Those years of development have made this a car that puts a very large smile on your face and I'm looking forward to getting acquainted with my “new” MGC over the next few months. The car was on display at MGC50 parked in the dining room with other notable Cs and also was at MG Live at Siverstone and even made it out on track. 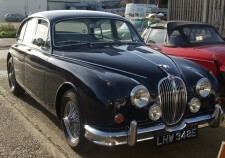 This is our demo '67 Jaguar Mk 2, fitted with a 3.8 litre engine and a 5 speed Jaguar gearbox. Rear spats have been removed and replaced with Coombes arches to accommodate larger rear wire wheels and tyres. We have also fitted uprated suspension, ignition system, air filtration, carburettors and exhaust system. Has seen 129.9 mph at the Jaguar Speed Trial at Woodbridge. This car is now sold. 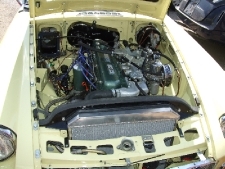 The engine bay of our Mk 2 Jaguar. Features straight port head, fast road cams, electronic ignition, stainless steel tubular exhaust manifold with large bore system and K&N air filter. We have just fitted a 123 distributor with 16 preset ignition maps. Wow, these things work well. A noticable difference in the drive. This car is now sold. 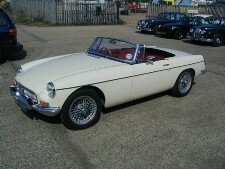 This is our '66 MGB Roadster in Olde English White. 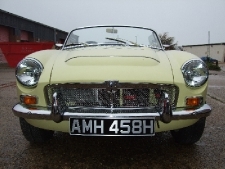 We have fitted uprated suspension and anti-roll bar, longer wishbone arms for better camber, castor reduction kit, rose joint drop arms, parabolic rear springs, 15" MGC wire wheels and an MGC rear axle and propshaft to facilitate the gearing. 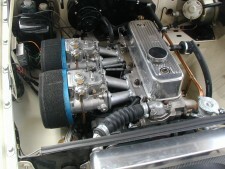 Engine bay of '66 Roadster featuring aluminium cross-flow cylinder head on a 1950 lightened and balanced engine. 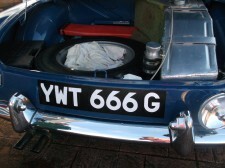 Also fitted is electronic ignition, a pair of 40 DCOE Webber carburettors, uprated exhaust system and remote oil filter. 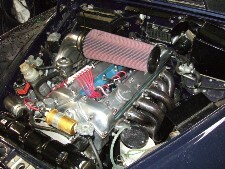 We have changed over to a 4 synchro overdrive gearbox and fitted an MGC 140mph speedo with corrected gearing for our car. We saw 111 mph through the timing lights in fourth gear without overdrive at last year's Jaguar Speed Trial at Woodbridge. 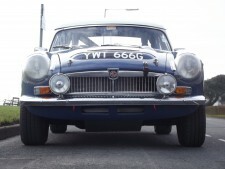 After fitting a 123 electronic ignition distributor to our Jaguar I had to try one on the MG. 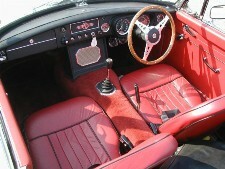 Interior of '66 MGB Roadster showing the red leather seats and red trim & carpet sets. Fairly standard on the inside except for the 4-point harness seatbelts, flyaway handbrake, steering wheel and foot pedals. MGC Roadster in Primrose Yellow. This car has had a full nut and bolt restoration by ourselves with over 1000 hours and £14,000 in parts put into the project. The bare body was mounted on a spit and sent for sand blasting. 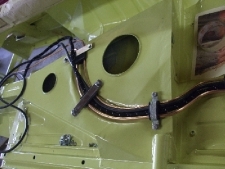 All weld repairs were then carried out including new floors, sills, rear and front wings, torsion bar panels, boot floor etc and then fully etched, primed and painted whilst on the spit. A lot of the rebuild was completed on whilst on the spit and all new brake pipes, loom and hoses were fitted. I have a 6 page parts list that shows all the parts fitted to this car. 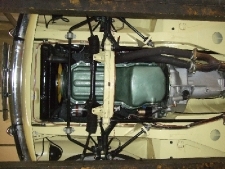 The car was removed from the spit, suspension was fitted and the fully rebuilt fast road engine was then refitted. A reconditioned dash was fitted along with all new carpets. The rebuild finally complete, the car was run in with Penrite running in oil and any snags attended too. I have fitted parabolic springs to the car and also an alloy radiator but these were more for testing purposes rather than anything being wrong with the original units. 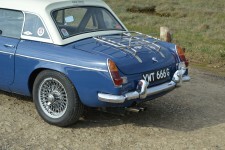 The car has now completed 2500 miles, she won 1st prize in concours at MGC Day in 2010 and is an absolute joy to drive. 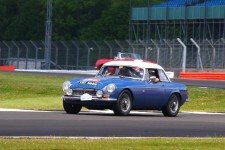 Recently I was asked to put "Maisie" on the MGC Register stand at MG Live at Silverstone. Please enquire for a test drive or viewing of the car if you are contemplating having works done on your car. 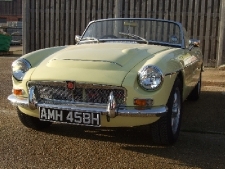 We are a family run business specialising in the restoration of classic cars since 1987 and for many years before this as enthusiastic home restorers. We have restored many makes but have long been regarded as MG marque specialists and are now carrying out an increasing amount of Jaguar work.